Instant pep talks to boost productivity aren’t the only thing you’ll get from Karen Salmansohns’ book Think Happy. The book culls great information from a range of sources: brain researchers, psychologists, philosophers, motivation researchers, research studies, and folktales. The artwork is colorful, playful and even happy, too. The book can be read cover-to-cover, or open a page any page to receive memorable quotes, meditations, lessons-learned, assignments, tips, and reminders. Keep the book on your coffee table, on your night stand, or within your tote bag to help think happy. I find myself thinking about Karen’s pep talks and telling other people about them, too. Makes a great gift! Sometimes you don’t know what you don’t know. In this case, I knew that the world of acrylic paint and mediums were foreign to me but after reading The Acrylic Painter by James Van Patten where he writes about tools and techniques, all those jars, tubes and bottles in the art supply stores finally made sense. I’ve experimented since reading the book with Golden’s cracked paste, fiber paste and pumice gel. The results are fantastic and open worlds of possibilities. Van Patten’s recommendations for a good set of brushes for the beginner have turned out to be exactly what I needed to know too. Who tells you these things? Right down to the brand and a picture of what the package looks like. And even though I’d heard about gessoing a canvas, Van Patten took the mystique out of a process that I imagined to be complicated and why would I even need to do that? The visual experience is handled so well in chapter four of the book and broke down form, value, color, texture, time and motion in easy to understand language, accompanied by photos. The book is an excellent resource and one that has taken a prominent place on my coffee table where every time I pick it up, I learn something new or have it reinforced again. I’ve even taken it with me to the art supply store where its helped me to decide on colors for mixing and types of paint that I previously hadn’t been able to decipher why I would want one type over another. I highly recommend the book for new acrylic painters and experienced ones as well. I received this book from Blogging for Books for this review. 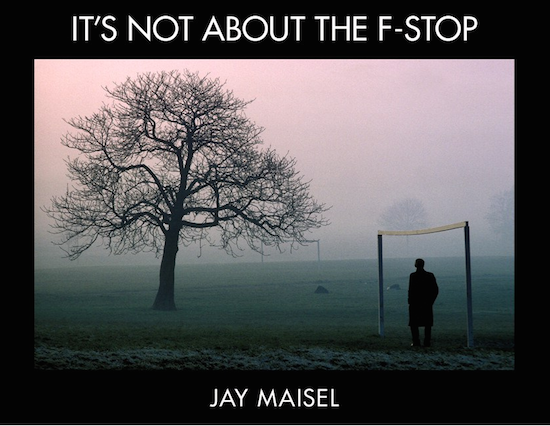 The book, It’s Not About the F-Stop is a beautiful visual and verbal exploration of photography from world acclaimed photographer, Jay Maisel. Reading through the book feels like you are sitting next to the photographer (a wonderful storyteller) as he shares story after story about where a photo was taken, on assignment or in-between, and the process he went through to get the shot. In the introduction to the book, Maisel credits his good friend with saying, “Photography is not about photography, it is about everything else.” And that he tried to talk about “everything else.” It’s immediately evident that he masterfully accomplished his goal. Maisel doesn’t discuss camera settings, histograms, the pros and cons of hand-held shots or tripods, instead he tells readers what he was thinking or feeling as he stood, crouched, and climbed to get a specific shot. And the serendipitous moments when the light changed or a person walked into a scene. Maisel’s photos span over many decades and his comments about each image give credence to showing up, being patient, looking at the world around us and finding inspiration in both the extraordinary and ordinary. Maisel also shares images that surprised even him, in one instance a beautiful photo of Marilyn Monroe that he doesn’t remember shooting, originally rejected because of the focus, but in the edit, decided he loved it. Another time, an ice rink where the skaters were moving so fast making it hard to get a good shot that he changed his attitude on what was presented on the surface. The photo shows a stunning dark silhouette amidst an etched blue, gray, green background. More than half-way through the book Maisel suggests that “Sometimes It Is the Lens.” We learn that in the past few years the photographer has significantly pared down his equipment and now walks around with one camera and one lens–a Nikon D3 with a 28-300mm zoom lens. Maisel advises photographers to look to art for inspiration, “its been around longer” than photography. While that may be true, readers won’t be able to help being in awe of the color, light and gestures seen throughout the photos in the book. This is a book that can be read cover-to-cover, again and again. And will make for a fine coffee table book that readers and photography aficinados can open to any page where they’ll discover visual gems.